Your morning can’t start off any better than this. 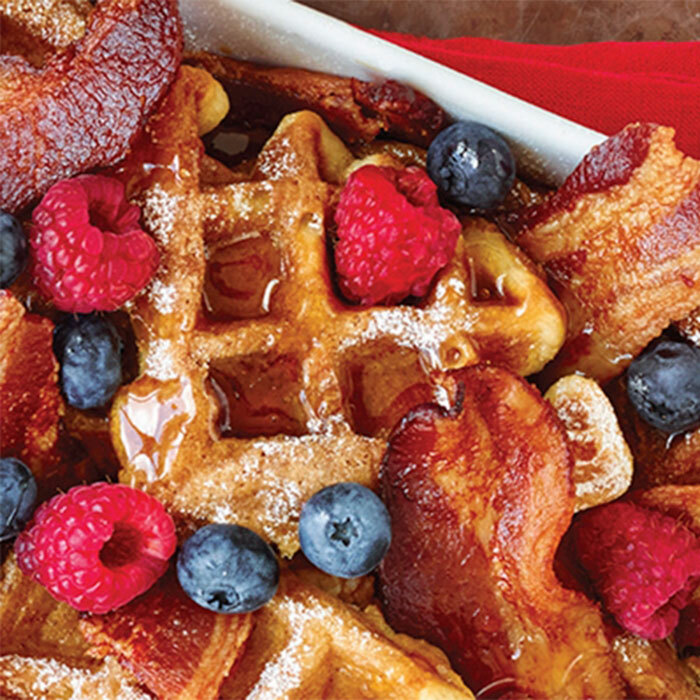 Mixed berries, bacon and buttermilk waffles are sure to please! Preheat oven to 350° F. Lightly grease 3-quart oven-safe casserole (8 x 10-inch or similar) with ½ tablespoon butter. In large bowl, whisk together egg yolks, buttermilk, cream, ⅓ cup syrup, vanilla and salt; reserve. On ungreased rimmed baking pan, spread waffle pieces in even layer and bake for 12–15 minutes or until crisp and lightly toasted. Increase oven temperature to 375° F.